America is Not Broke! : The Book: America is Not Broke! The unsustainability of the American economy is as familiar as the newscycle. There is no money for social programs, no money to run the government, no money to cut taxes, and above all, we have to cut, cut, cut. But, what if it’s not true? Instead of familiar complaints about the national debt, leading to just slicing a shrinking economic pie differently, or worse, to Austerity Economics, the reality is that we already have all the wealth we could ever need. The tried and proven proposals in America Is Not Broke would guarantee America’s prosperity, fairness, democracy, and economic and ecological sustainability. Four multi-trillion dollar reforms: Sovereign Money, Georgism, Public Banking, and Ending Government Financial Asset Hoarding, plus a few other major reforms, show how we can have it all, if we only learn where to look. Scott Baker has written a valuable, important book which offers practical, yet dynamic and untapped solutions that could be major game changers for the US, for struggling states, cities and counties. Better, these solutions serve the 99% and undermine and take away power from big banks and finance companies. Arthur Clarke said, "Any sufficiently advanced technology is indistinguishable from magic." Baker's ideas may look like magic but they are rooted in visionary, solid thinking and ideas. 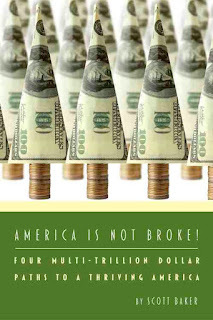 Scott Baker, a reliable and powerful supporter of the public banking movement, has now taken his writing and activism to the next level in writing America Is Not Broke! This book dispels the myths about public banking and our monetary system in general. It is welcome outside-the-box thinking and I heartily endorse it. We each have our own idea for that rhetorical sprinkle to best accent the flavor of a book like this. When I dug into the main dish I fell in love with a deep, rich taste I would describe as . . . economic orthodoxy! Scott Baker's impeccable research reminds us that what some call, today, "out of the box thinking" is actually yesterday's economic orthodoxy - one that served much better than our recent failed experiment with 100% monetary privatization. We have become a modern-day prodigal son, awakened to the foolishness of the squandering of our inheritance. In many nations, economists and those knowledgeable of money and banking are getting the picture, and doing something about it. America Is Not Broke! is extensively researched, interesting and thought-provoking on every page. Most importantly, now that we realize we cannot get on top of our debt even with the ever-growing austerities some call for, it shows us the way to the feast awaiting when we find our way home! For more than four years Scott Baker has been challenging the false narrative of Wall Street, the Federal Reserve and the deficit hawks that led America and the world into economic catastrophe. America Is Not Broke! Four Multi-Trillion Dollar Paths To A Thriving America will take its well deserved place in the literature of an America resurgent, an America in which the vast common wealth of the American people is put to work to take back our stolen economy, politics and future from the parasites in pinstripes. -- Mike Krauss is the founder and chair of the Pennsylvania Project and a leader of the growing nationwide campaign to rebuild local economies with locally generated capital and affordable credit. America is Not Broke! promotes land value taxation as a just and viable alternative to our current economic model which taxes labor and encourages rent seeking. Scott Baker has written a convincing and lucid exposé that should be required reading for students of political economy and all those interested in reversing the dangerous trend of wealth concentration in this country and others. America is not broke!" reveals the mess that is our current monetary system, and presents some essential reforms that would allow us to reclaim democratic control over the power to create money. -- Ben Dyson, Founder Positive Money Campaign, U.K.
Scott Baker, who lectured us on Public Banking, is a great speaker to we at Occupy Wall Street's Alternative Banking Group. He now gives us his knowledge in America Is Not Broke! Both Progressives and Conservatives will enjoy this book. Test my words! I endorse this excellent work, which should occupy your book shelf. -- Manny "Manhattan" Cavaco, producer of the Manny Manhattan News cable television program. The #1 best book ever written on the subject of economics is "The Road to Serfdom" by F. A. Hayek. You must read this book. For scholars, A must read is "Human Action" by Ludwig von Mises, who is the father of the Austrian School of Economics. Undergrads should read deeply at https://mises.org and subscribe to their email list.